Looking for a detailed Whole30 food list? Why not let us take care of your entire Whole30 with an easy Whole30 meal plan with shopping lists? The meal plan features delicious real food recipes that are all 100% Whole30 compliant so you don’t have to worry about reviewing a Whole30 food list to determine if an ingredient is Whole30 approved. Don’t worry, we have you covered with all of the Whole30 recipes you need for each day of your Whole30! When we made our first Whole30 meal plan last year, we received so much positive feedback from people who used it that we decided to do a new one with a fresh Whole30 food list and recipes! 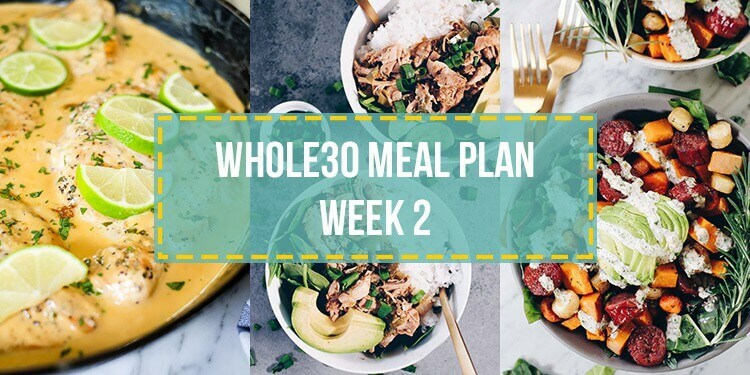 Since we know that doing a Whole30 can be pretty daunting, we’ve created a meal plan with 100% compliant Whole30 recipes and shopping lists for each week to make your Whole30 as easy as possible. If you follow our plan, you’ll take some of the stress out of doing a Whole30, discover some new Whole30 recipes your family will love and hopefully crush it for 30 days! On the fence about doing a Whole30? We get it, doing a Whole30 takes a lot of work and some people aren’t quite sure if it’s worth it. It does require a lot of effort and is a huge change for most people. However, it can also be a life-changing experience and can change your relationship with food in health in such a positive way…….so go ahead and go for it! We’ve got your back with this meal plan, delicious recipes and helpful emails with tips, resources and guidance along the way. Just sign up and we’ll send you all the Whole30 recipes you need and a printable plan for each week of your Whole30! 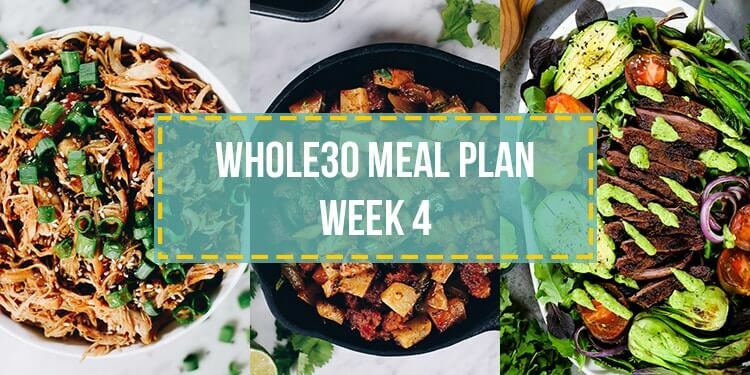 To make this Whole30 meal plan we’ve used our own recipes, calculated the serving sizes and compiled the ingredients into a shopping list for each week. We also have full recipes and instructions for each meal, flexible prep instructions and make-ahead meals to help save you time and effort. All you need to do is print out the weekly plan and follow the instructions. 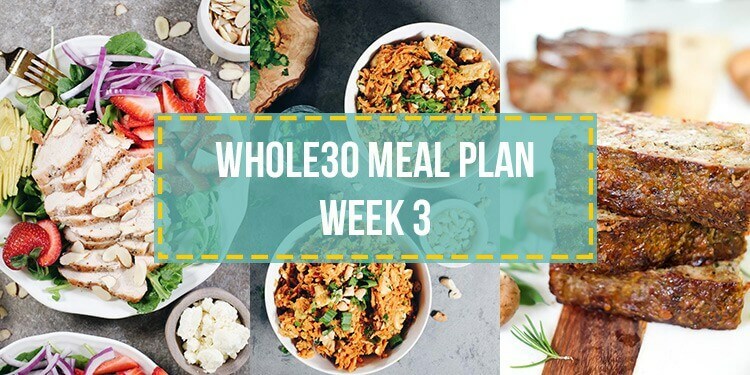 You’ll be all set with our detailed Whole30 meal plan! Don’t worry about scanning Whole30 food lists to verify that the ingredients are compliant, we have you covered! We’ll deliver a new weekly plan via email for each week of your Whole30. 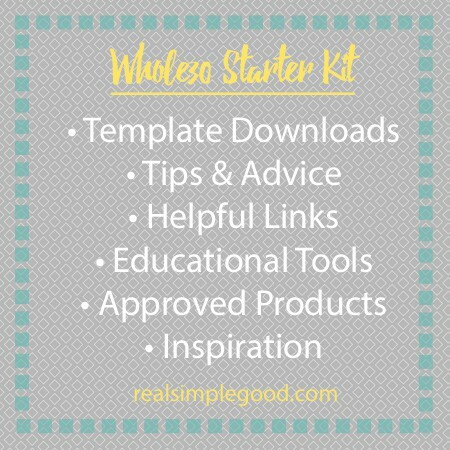 In addition, we’ll send you emails with helpful tips and tricks, Whole30 compliant product recommendations, helpful kitchen tools and much more! Just sign up below and we’ll send you an easy to follow meal plan for each week of your Whole30! In addition to the Whole30 meal plan with our own Whole30 recipes, we also put together a Whole30 Starter Kit to help you get going. This kit has a helpful Whole30 food list infographic that you can refer to if needed. It also has a collection of Whole30 compliant products, helpful kitchen tools, pantry swaps, snacks, etc. This starter kit will arm you with the information and tools you need to get started on your Whole30 journey. We’ve also put together a Whole30 Resource Page. On this page you can find Whole30 compliant brands and products. Be sure to check this out before you do your shopping so you are familiar with some options to find compliant meat & seafood, pantry & fridge staples, emergency snacks and drinks. We update this page frequently to feature the latest Whole30 compliant products we use in our own kitchen. 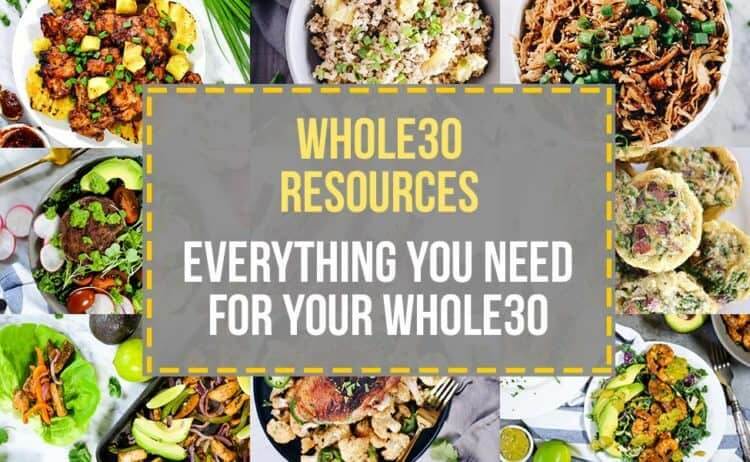 You can check out these Whole30 resources here. 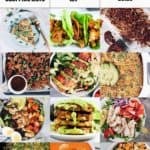 Here are the whole30 recipes in the meal plan! 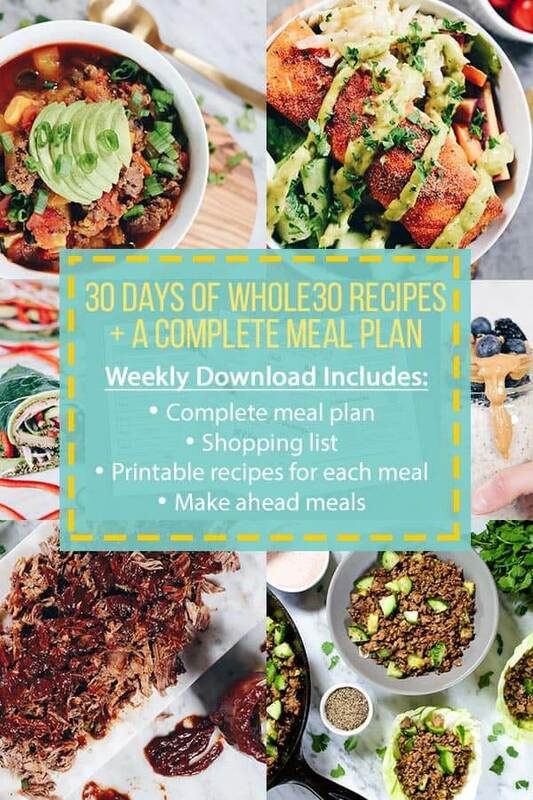 Below is the complete listing of Whole30 recipes featured in the meal plan! Click around and see all the delicious food in store for your Whole30. *Make ahead meals. Prep these meals over the weekend to have on hand for warming up quickly during the week. **Scramble four eggs and season with salt and pepper. Once eggs are cooked add in 2 handfuls of spinach and cook until wilted. Serve with a scoop of sauerkraut. *Make ahead meals. Prep these meals over the weekend to have on hand for warming up quickly during the week. For the zucchini lasagna, you can cook it entirely on your make ahead day or just prep the lasagna ingredients and bake it later. 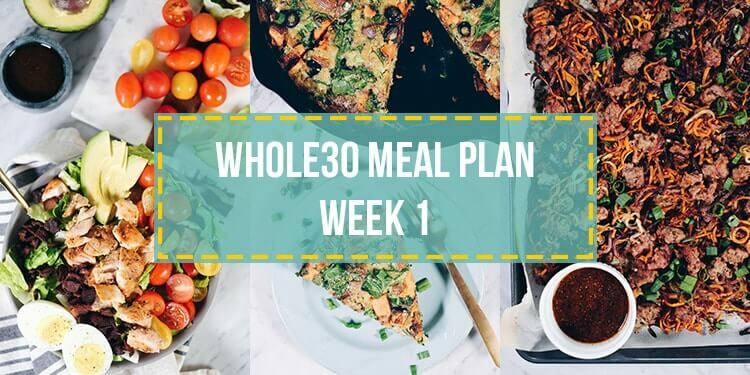 Just sign up below and we’ll send you a detailed plan for each week of your Whole30! Have any questions about our Whole30 meal plan? Just leave a comment below, and we’ll get back to you shortly. This is coming at such a perfect time! My husband and I are going to be starting our second round of Whole30 on Saturday and we used your other Whole30 meal plan for our first round and loved it! Can’t wait to try all of these recipes. Thanks Justin + Erica. Hi guys! Your meal plan seems like it will be really helpful! I have decided to begin my whole 30 on September 10. I know that is far out but I am trying to mentally prepare myself for the time just like I did when I quit smoking. I am excited to begin this journey and thankful for all the resources you provide. Lekeysha – thank you and we are happy you found our meal plan! Best of luck and let us know if we can help in any way :). My husband is doing whole 30 this month for the first time. We just googled “whole 30 meal plans” and got your site. I have to tell you your recipes have been consistently delicious and easy! We’ve been making 3-4 of your meals a week and doing eggs, roasted meats, and veggies in between. Every one of your recipes has been a winner. My husband is still raving about the hollandaise sauce we tried on week 1. Thank you, thank you, thank you! Thank you so much for the kind review! We are so happy to hear that you are enjoying the recipes and your Whole30 is going well :). Hello, I signed up to get the meal plans, and have received emails with tips and such, but I haven’t seen the meal plan/shopping list as of yet. I double checked my spam folder, and it’s not there. Am I missing something? Theodora – I just emailed you a copy of the meal plan for week 1. I found your meal plan on Tuesday Jan 1 while looking for some new Whole30 recipes and jumped right in! So far, the grocery list and meal plan have been extremely helpful (and delicious)! Do you know when I’ll receive the week 2 email? I skipped Day 1 since it was already Tuesday, and want to make sure I can get the shopping list on Saturday so I can prep for week 2 starting Monday. Just want to make sure the “weekly” isn’t based on when I downloaded originally. Jon – the plans are sent weekly based on when you signed up. However, I will send you the remaining weeks so you have them when needed for shopping. Thank you, thank you, thank you for these great meal plans!!! Your plans are what made Whole30 do-able for me the last 30 days. The recipes are simple and the food was delicious. I’ve signed up for the 2018 plans just so I can continue with the meal prepping for work. I’ve tried other meal planning services and yours is by far the easiest and most user friendly one I’ve used! Is it free after the first 30 days? The meal plan is 100% free but only lasts for the 30 days, it doesn’t go beyond that. Hello, I signed up to receive the Week 1 meal plan with grocery list, but it didn’t arrive in my regular or spam mailbox. Thank you for taking the time to put all of this together! Rachelle, we checked in our system and it looks like you received the meal plan. Please email us at support@realsimplegood.com with any issues. Hi there! I am excited to use your meal plan, however I do not eat seafood at all. Can I substitute chicken for the seafood recipes? Also, do many of your recipes contain carrot? My husband has a carrot allergy so I wanted to check before we sign up for the plan. Thank you! Molly – Every recipe is listed in the blog post above, so you can read through them and click on each recipe to see the ingredients. There are a few seafood recipes that could be subbed with chicken (you’ll have to adjust the cooking time). For any recipes with carrots you could replace those with another vegetable. Hi J&E, thanks again for putting all the materials together to make this so easy for us. I actually started week 1 on Monday and bought all the ingredients based on your week 1 menu. Wondering if you can have week 2 sent to me so that I can meal prep this weekend. I signed up today but assume that I will be sent week 1. Thanks so much!! Hi Serena – We just sent you an email with the meal plans!